Three Christmas Classics -- on one DVD! 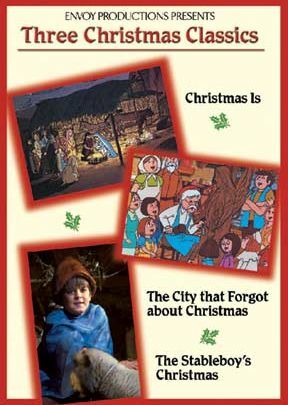 This DVD is a collection of three children's Christmas stories, all of which were originally produced in the 1970s and 1980s. All three of them are less than thirty minutes long and make for great family viewing for children under twelve. They can also be used in classes for small children to help them better understand the Christmas story from various perspectives: a stableboy's perspective, a shepherd's perspective, and the perspective of those who don't know about Jesus. The first story is a live-action program called The Stabelboy's Christmas. It starts out in the kitchen of a modern day family. The daughter decides that she doesn't want to give one of her gifts away and instead wants to keep it to herself. When her mother scolds her for being selfish, the girl runs to the living room and sits in front of the Christmas tree. At that moment, the stableboy from the Nativity scene magically comes to life. Soon we are in the stableboy's world in Bethlehem and are treated to an experience of the first Christmas from the stableboy's perspective. Over the course of the story the stableboy not only learns to give to the Christ child, but so does the greedy innkeeper for which the stableboy works. If your feel like you are seeing some familiar faces in this program, you probably are. The innkeeper is played by William Schallert, who has had over a hundred film and television roles, and the Roman soldier is played by Dave Madden, who is better known for playing Reuben Kincaid in the TV series, The Patridge Family. The second story is a cartoon called The Town That Forgot About Christmas that features a young boy named Benji. As the story begins, Benji's parents are getting ready for Christmas, but don't show a lot of Christmas spirit. Frustrated, Benji and his friends visit Benji's grandpa. When Grandpa sees how disappointed Benji and his friends are, he tells them the story about the city that forgot about Christmas and since they forgot about Christmas, they also forgot about love. As the tale begins, we see that the townspeople are very mean-spirited. Soon, a stranger named Matthew comes to live in the town. Matthew starts doing all sorts of kind deeds for people in the town but since the town had forgotten about Christmas, they didn't know what to make of Matthew's kindness. When the children ask Matthew why he's so nice to everyone, Matthew uses the opportunity to tell them Christmas is about Jesus! But when the mayor finds out about this whole Christmas thing, he's not very happy. So, in order to stop Christmas from happening he and his thugs steal the baby Jesus from the nativity that Matthew's been carving. So of course the ploy is unsuccessful and the townspeople discover that Jesus would still be with them. Finally the last story is another cartoon called Christmas Is. The story again features Benji but this time Benji is frustrated about having to play the second shepherd year after year, the least important part in the school Christmas pageant. However as Benji reads the Christmas story to himself, he is transported back to ancient Bethlehem. There, he spends the night working in the inn where baby Jesus is born. 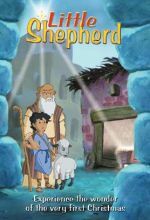 When Jesus is born, Benji goes to the stable and meets the real shepherds, including the real second shepherd and discovers how important the second shepherd really was! But the shepherd tells Benji that it's the Christ child who is really the important one. This DVD would not only make a great addition to one's collection for families with young children, but it would also fit well into a young children's Sunday School Christmas Curriculum.